GREAT LOCATION in downtown Pismo Beach. 50 yards from the beach and a block from the pier with partial views. 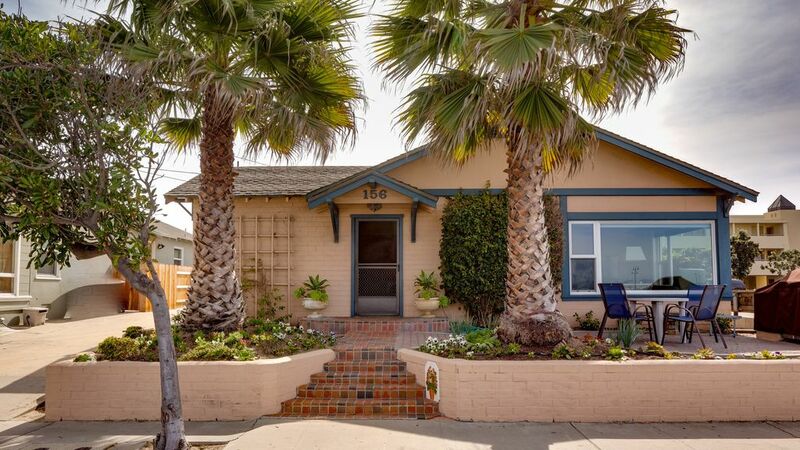 This home (not condo/townhouse) is in downtown Pismo Beach! (It's not in Pismo State Beach or Oceano. Be careful, as some listings advertise Pismo Beach when they are in Oceano) Walk to everything. Play at the beach and come home to use the restroom. 3 bedroom 2 bath home with ocean views. The house sleeps 6 people and our maximum occupancy is 8 people. California Vacation Rentals also owns the home next door that is also a 4 bedroom/3.5 bath house that has great views VRBO #127874 and a 6 bedroom house VRBO #87222. The home is incredibly decorated with hand painted tiles and murals, granite slab counters, fully stocked kitchens, 46' Samsung HDTV with DVR and DVD, and garage parking. This is a home, NOT a small condo. The bedrooms have a King, Queen, and Queen. We use Peacock Alley sheets and duvets that are professionally laundered after each stay. The location is perfect as you are one block from the pier and downtown. Location, Location, Location!!! Please be careful renting in Pismo Beach. Many homes in this section are advertised as being in Pismo Beach, but are actually in Oceano or Pismo Beach State Beach. This house is in downtown Pismo Beach. We have been with VRBO since 1999. California Vacation Rentals is a family owned and operated vacation rental company that manages properties in Pismo Beach, Lake Tahoe and San Francisco. We take great pride in all of our homes. Location Location Location If you are a larger group, consider renting the 4 bedroom next door. This home is right by the boardwalk, pier and beach. The house is only a block from the pier and downtown. We never use our car when we are in town. Pismo Beach is a great walking beach.